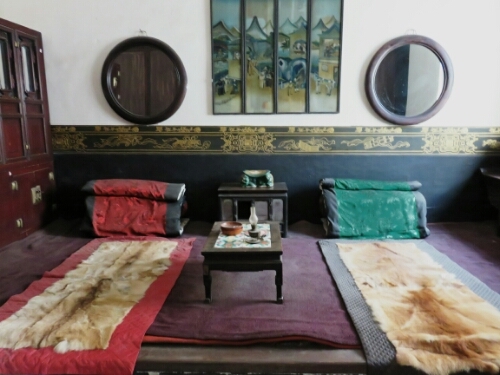 In Pingyao we made our way to some accommodation highly recommended by the Lonely Planet: The Harmony Guesthouse. It was OK and neither Meka or I could work out quite why the Planet was so in love with it. Still it did have pleasant albeit tiny rooms. Pingyao itself, on the other hand, was definitely worth the guidebook’s recommendation, I really enjoyed it and felt that it fulfilled any imaginings I had had about the ancient Middle Kingdom. Pretty much the whole of the old city is preserved and many important buildings have been restored and opened to the public. It is possible to wander around all day lost in the ambiance of the place. Stepping inside whichever of the buildings interests you. For instance Pingyao is famous for having the first Chinese draft banks and there are a few of these you can look round. Including some massive underground vaults in one. 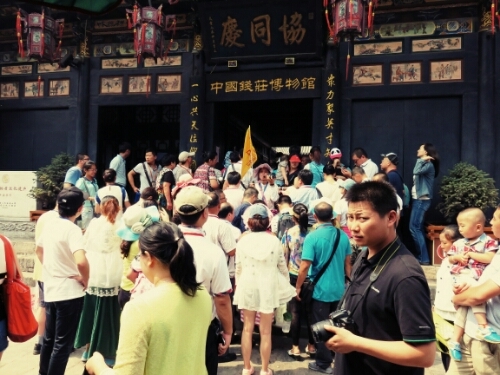 The city also had numerous guard companies, which were responsible for escorting gold and valuables around the more lawless China of the past. Some of their properties are open with explanations of the guard companies’ role. 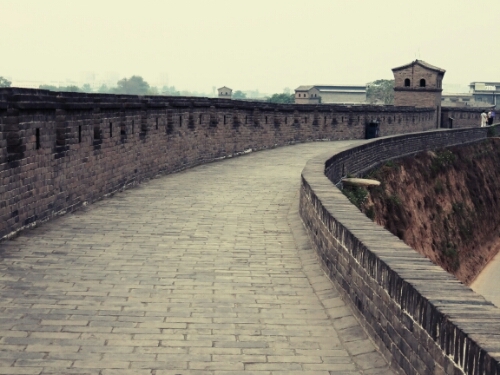 Pingyao is also noted for having an intact set of city walls that you can walk around. They are not as grand as Xi’an’s but they are much less busy and the view from the walls is far more interesting if a little personal at times. 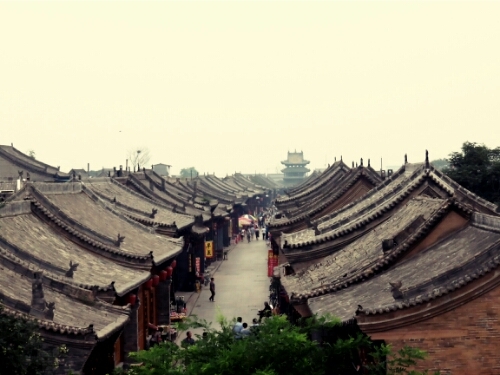 The only issue I had with Pingyao was that in some ways it is a victim of its own success. It is extremely touristy – there is shop after shop selling tourist tat, many of them very similar. There are also of course hordes of tourists many in large groups and few with an understanding of basic queueing. Still this was not enough to spoil a lovely place and it is one of the cities I have enjoyed the most on the trip. It was of course not possible to stay there forever and the time came for Meka and I to set out once again for what would be our last leg travelling together. Meka had to head for Beijing in order to start her journey home and I was continuing on towards the ferry for Korea. The first day out of Pingyao we took it easy and rode a fairly short day to Jinzhong. 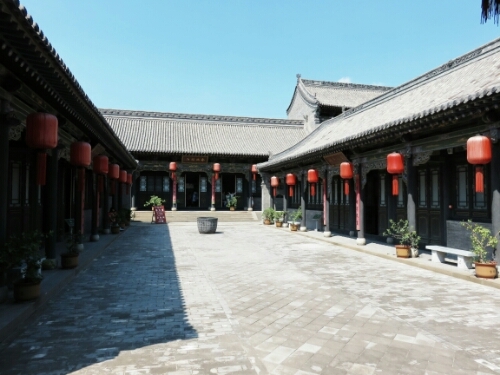 We were also able to fit in a visit to the Qiao Family Compound, a huge 18th century complex of courtyards with over 300 rooms that used to house one extended family. 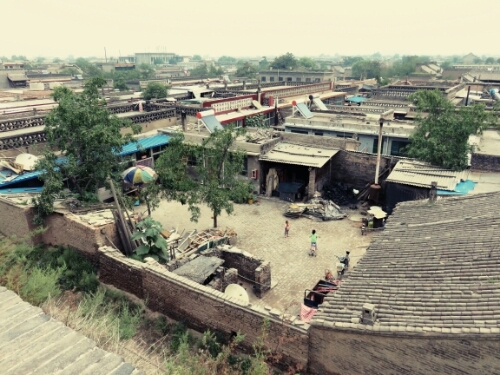 It felt more like a village than a family home and like Zhang Yimou’s Raise the Red Lantern which was filmed here it went on forever and ever. 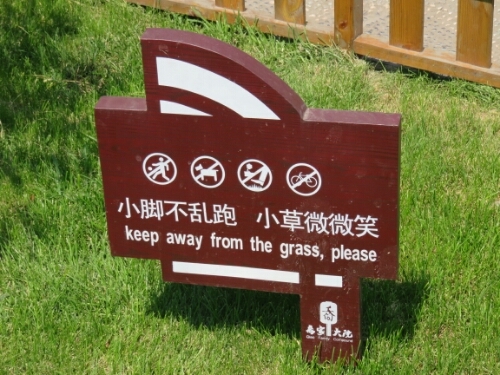 That said it was one of the more interesting sights I’ve seen in China if only because it had a lot more English language signs than most places; this meant that I had more than a passing idea what was going on. The place was truly huge though and it was more exhausting than cycling looking all around it. There was room after room with detailed explanations of what they were for. There were the rooms you might expect including bedrooms and kitchens and dining rooms. On top of that there were other more unusual rooms, such as a room for weddings and even a room for celebrating the birthdays of old family members. After we’d finished looking around we made it to Jinzhong and found a cheap hotel that didn’t ask too many questions and let us stay even though they were clearly not licenced to take foreigners. The next day we headed on in no particular rush. The weather was lovely and had been so for a while now. The terrible rain showers around Lanzhou and Xi’an were fading memories. We were on a very pleasant road to start with as well, it meandered up and over hills with beautiful willow trees framing the route. Sadly we came off that road and ended up on one with coal trucks again. Once more the side of the road was black instead of green. On the plus side the scenery was still lovely. 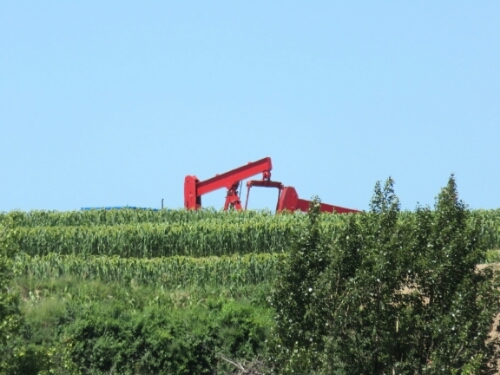 We also saw a few oil wells as we rode along which I found quite strange. Before I had only seen them in drier more arid areas like the desert in Kazakhstan. It was odd to see them in the middle of a field in China with crops growing around them. That evening we would reach the town of Yongyuan, which was another Chinese city built along a river valley. This one was very pretty stretching down between some beautiful mountain peaks and with a river that had been nicely looked after. 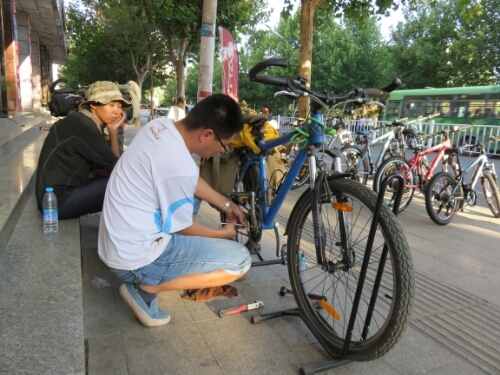 In Yongyuan we had to find a bike shop to check Meka’s bicycle. It had started to make a horrendous clicking that nothing I did seemed to help with. Luckily after some trial and error the bike shop we took it to was able to work out that it was the bottom bracket that needed cleaning out. The unpleasant weather conditions we had been riding in had taken their toll. After the bike shop we managed to find a hotel to stay in. 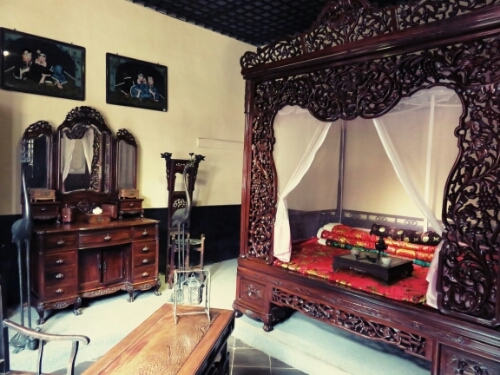 It described itself as Yongyuan’s ‘First chain like’ hotel. Which I thought was interesting as in the west there is a very strong move away from being perceived as ‘chain like’, here it appeared to be considered a virtue. Though to look at the fixtures and fittings there it may be that 20 years ago it was considered a virtue. The next day the weather continued fine as did the scenery. We were riding through a hilly area that had many villages cut into the sides of the inclines. These were very pretty and were in the main made from a distinctive grey stone. Luckily while it was hilly we were mainly going downhill. That day we would unexpectedly come upon a restored part of the Great Wall which was in far better condition than the other parts we had seen on the trip. It was possible to see it quite clearly from the road as we went past. 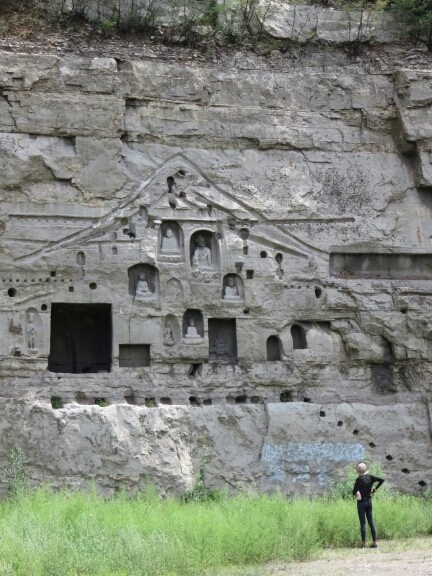 Later on when we stopped for a break we also spotted these Buddhist carvings set into the rocks by the side of the road. It was nice as it felt like something we wouldn’t have ever come across if we hadn’t been cycling. Most of that day we had been riding down back towards sea level but towards the end of the afternoon we headed back up into the hills. That night we would be staying in Yujiacun known as the Stone Village. It is famous for being a preserved 16th century stone clan village. 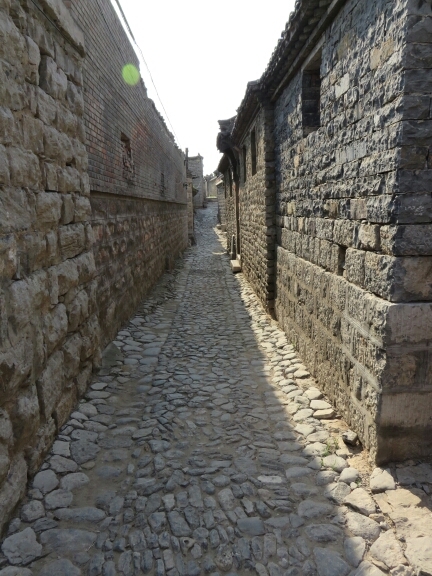 Basically almost everyone in the village is related to one ancestor named Yu and they built the village with stone. According to the tourist literature ‘You are just in the world of stone, stone streets, stone lanes, stone houses, stone yards, stone tables etc’. While there was a lot of stone I was quite disappointed, the other ancient Chinese village we had stayed in had been pretty stony as well but hadn’t made quite such a fuss about it. What was interesting was the village’s pagoda. Apparently this had been erected by one man a few hundred years ago and he was something of an amateur architect so it has something of a thrown together look. We also got to stay with some locals which was nice if a little grubby (it was totally filthy). They made a lovely dinner and what was I am sure a lovely breakfast if you enjoy that sort of thing (Meka and I really didn’t and it was only politeness that let to us eating any of it). The next day we started out for what would be mine and Meka’s last day cycling together. 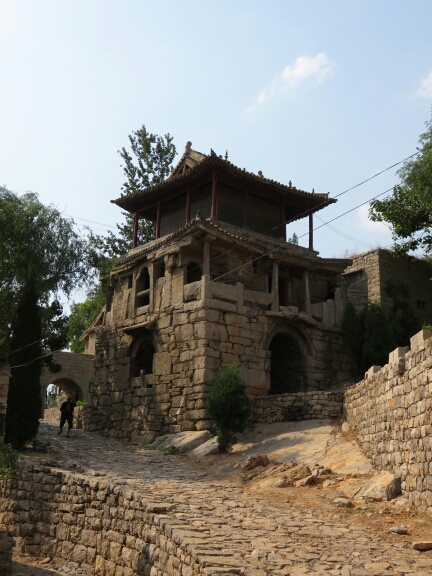 It was a short trip down from Yujiacun to Zhengdian a city famous for its temples and pagodas. Short but still dusty and polluted as we were riding with the ubiquitous Chinese truck as usual. 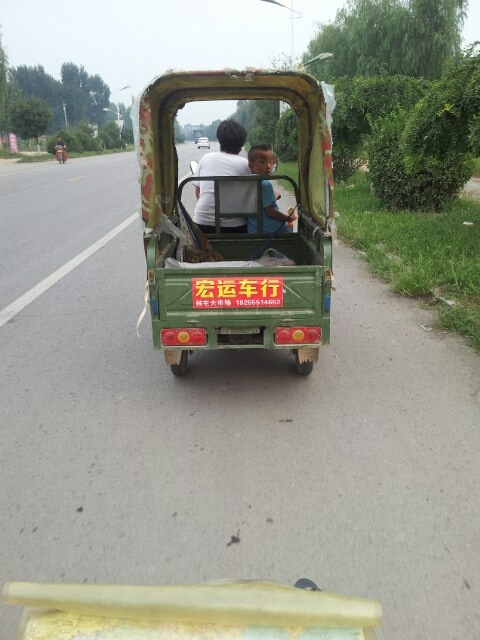 In Zhengdian we had trouble finding a hotel as the first two wouldn’t accept foreigners. 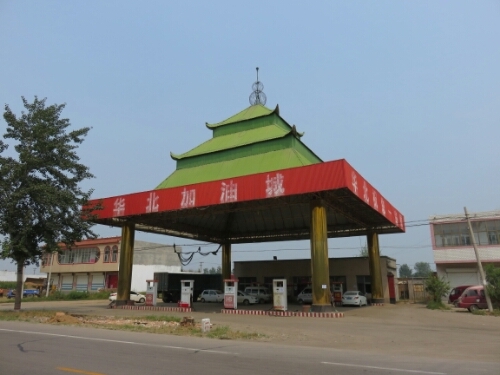 This included a 7 Days Inn which is part of a national chain and which does accept foreigners in some provinces but not in Hebei where we were now…which was annoying to say the least. Luckily they were able to point us to a hotel that would take us though it was of course a bit more expensive than we would have liked and a lot more expensive than it was worth. 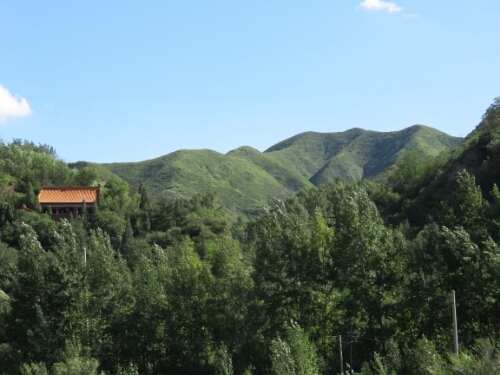 In Zhengdian we picked the most famous of its temples to have a look round: The Liaoxing temple. This was nice as Chinese temples go, though we were both getting fairly bored of the copious amounts of Buddhas there are to see. 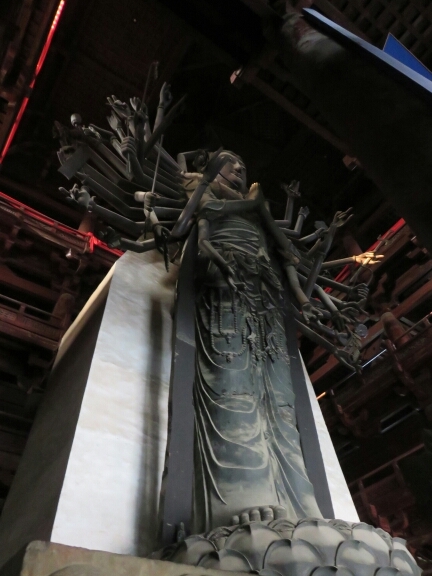 The Liaoxing temple had at least one unusual thing to pique our interest: a 21m high statue of the Goddess of Mercy. That evening we would totally fail at having a nice goodbye dinner. We ordered a random set menu that turned out not to have anything we particularly enjoyed – at least it was kind of nutritious. The next morning it was finally time to say goodbye to Meka. 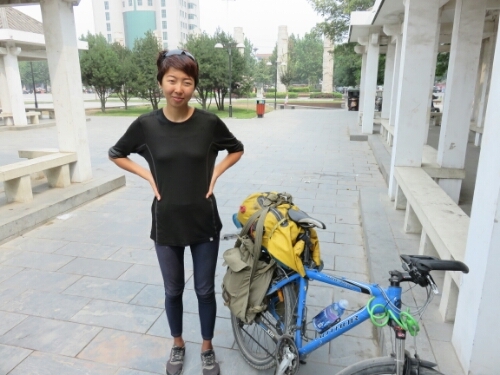 After almost three months of riding together it was time for her to head off to Beijing so she could start to make her way back to Bishkek. Our goodbyes were unfortunately interrupted by a massive fight just down the road – the highlight of which was a man who was being kicked on the ground managing to scramble inside an under construction building only to come charging out seconds later swinging a long handled shovel. Luckily he didn’t connect with anything except the ground, albeit in a dramatic fashion and eventually the police arrived to calm things down. Once that was concluded we were able to make off in our respective directions. My first day solo was fairly uneventful, the land had flattened out almost completely and it just involved me putting the hours in to make some distance. As it was flat I just got my head down and pushed on, riding seven of the eight hours of daylight left. That evening I would make it to Nangong where I was turned away at the first hotel (I was still in Hebei) but allowed in the second. The next day I got up ready to head off for another long hard day. Without Meka to hold my bicycle while loading it I had to make do with this handy gentleman. As expected the land remained flat and like the day before I just rode and rode able to average around 20kph for the whole day. While riding I was able to slipstream behind a lot of little electronic trucks that weren’t going much faster than I was, this helped make up for a slight annoying headwind. One of the carts (not pictured) had a little boy in it who upon seeing me following behind threw himself down on the bed of the truck in fear. It took his mother a while to coax him out but by the end he was waving at me as we went. That evening I reached Qihe, which like many Chinese cities was much larger than I was expecting, it was so large that I must have ridden right round the hotel district as it took me a while to find anywhere with somewhere to stay. In the end I found a place that didn’t have the Chinese characters for hotel that I was used to in its name maybe because it seemed to be a smaller more basic sort of hotel. It was happily a lot cheaper as well and even more happily still had all the facilities I actually needed like a bed, shower and even the luxury of WiFi. It was also cleaner than some of the more expensive places I had stayed in. 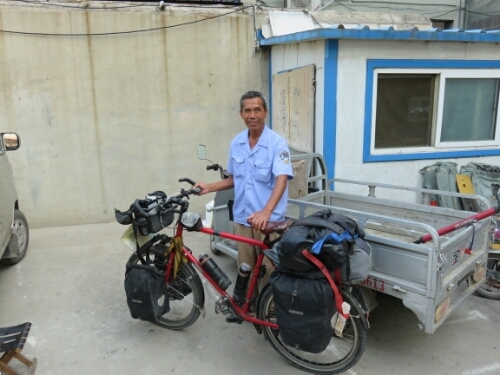 The next day I had a shortish ride to my destination of Tai’an where I was planning to stop a day in order to climb the sacred mountain of Tai Shan. The day while short was more eventful than expected. Googlemaps which I was using courtesy of a VPN now decided to take me down some very rural roads. 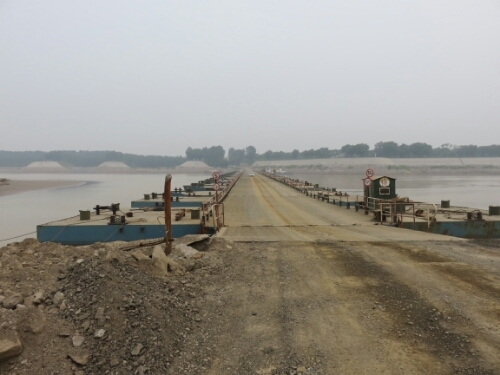 I also crossed the Yellow River on a pontoon bridge. I ignored the signs saying no bicycles as I couldn’t see a good reason not to. I’d encountered the Yellow River before, crossing it at Lanzhou – it had been too rainy for photos then and it was much less wide further up in the mountains. The Yellow River is a bit of a misleading name as well, as the river is really more brown – I guess the Brown River doesn’t sound quite right…. While riding I also came closer to accidents than at any other time on this trip (apart from when I was in one of course), not just once but three times in one day. Twice when cars pulled over right in front of me and once when a bus pulled in. I had to slam on the brakes all three times and one time I actually came off the bike as I broke so sharply I almost flew over the handlebars. Luckily I was just a bit shaken and no harm done. In the end I managed to survive the rest of the ride and got to Tai’an in the afternoon. 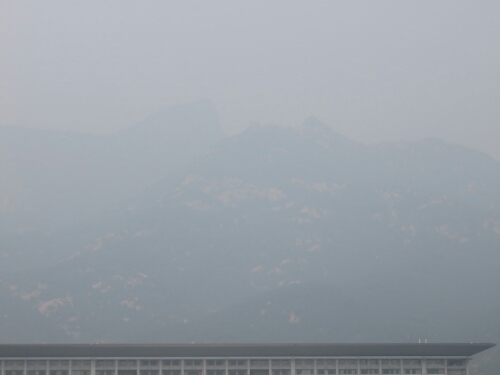 It was so muggy/smoggy that I couldn’t actually see the sacred mountain when I arrived.